Does the library have the "Tulsa World" online? If so, where and how do I access it? - Ask Us! Q. Does the library have the "Tulsa World" online? If so, where and how do I access it? If Chat is offline, try finding your answer in our FAQ database by typing the subject of your question in the box above and viewing the FAQs that appear as you type. If you don't find what you're looking for, you may submit your question and receive an answer via email as soon as possible. All four TCC campus Libraries have individual subscriptions to the print paper and digital format. Please visit one of our locations to view the online subscription on-campus. TCC library staff will have to log you in to use the online access. 1. Go to the Articles & Databases link. 2. In the by Type drop-down menu, select Newspapers. 3. Click on Newspaper Source Plus, a newspaper database that has the publication Tulsa World. 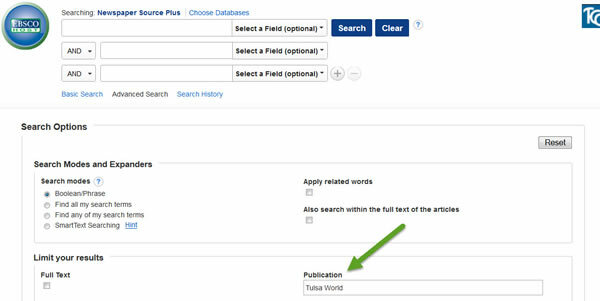 To specify a search only in the Tulsa World newspaper and excluding all other newspapers, see the screenshot with the green arrow pointing where to type Tulsa World . Then you can add your topic in the top search box to see results from the Tulsa World newspaper only. Tulsa World is also available via the Tulsa public library's (TCCL) subscription to Newsbank—America’s Newspapers (1/1/1989 to present; html plain text, full-text access to articles; access at all TCCL libraries and online. It requires sign-in with a valid TCCL library card number).